On Thursday morning during his homily at Mass in Casa Santa Marta, Pope Francis says that Jesus invites us to 'radical reconciliation'. 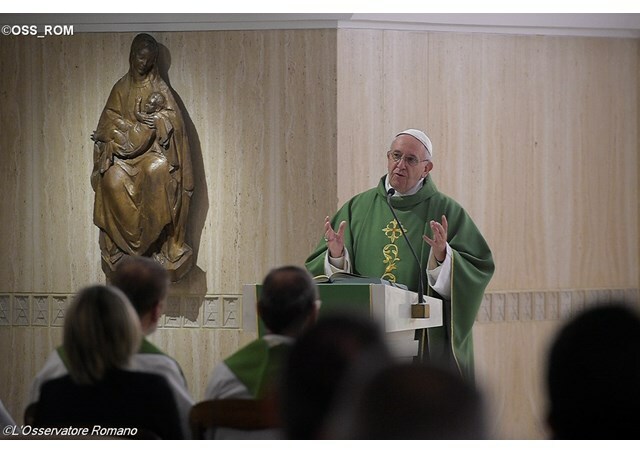 Pope Francis used the Gospel of the day (Matthew 5:20-26) as the point of departure for his homily on Thursday morning during Mass at Casa Santa Marta. He said that Jesus desires “radical” reconciliation. The Pope said that Jesus uses human wisdom in reasoning with the disciples. In order to drive home his teaching regarding loving relationships, the Lord uses an “every-day example…the problem of insults”. Pope Francis smiled as he said that the list of insults Jesus cites are ancient. Jesus tells us that insults “open up a path that ends in murder”. We disqualify others through insults. They rob people of their respectability. By insulting people we silence them, we take away their voice, he said. Insults are so dangerous because they lead to envy, which is how the devil entered the world according to the Book of Wisdom, the Pope said. “When another person does something I don’t like … or when someone threatens me, envy pushes me to insult them”. Have I insulted anyone today? When do I use insults? When do I close my heart to another with an insult? Can I see the bitter root of envy there that pushes me to desire the destruction of another in order to avoid competition, rivalry, that type of thing. It’s not easy. But let’s think how beautiful it would be if we never insulted others. May the Lord grant us this grace. Jesus wants us to stop this dynamic, Pope Francis said concluding his homily. When you go to Mass and you are aware that one of your brothers has something against you, go and reconcile yourself… Jesus is that radical. Reconciliation is not the same as good manners. No, it’s a radical attitude, one that tries to respect the dignity of others as well as my own. From insult to reconciliation, from envy to friendship—this is the example that Jesus gives us today.